LA Window Cleaning - A Full Service Window Cleaning Contractor. Whether your building is a high-rise, mid-rise, or low-rise, staff at LA Window Cleaning have the equipment and the specialized training to clean your windows professionally and safely. 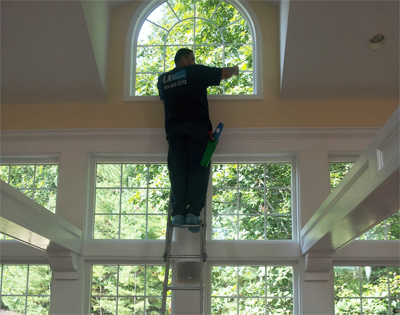 We have cleaned windows for hundreds of businesses across New England for over thirty years. 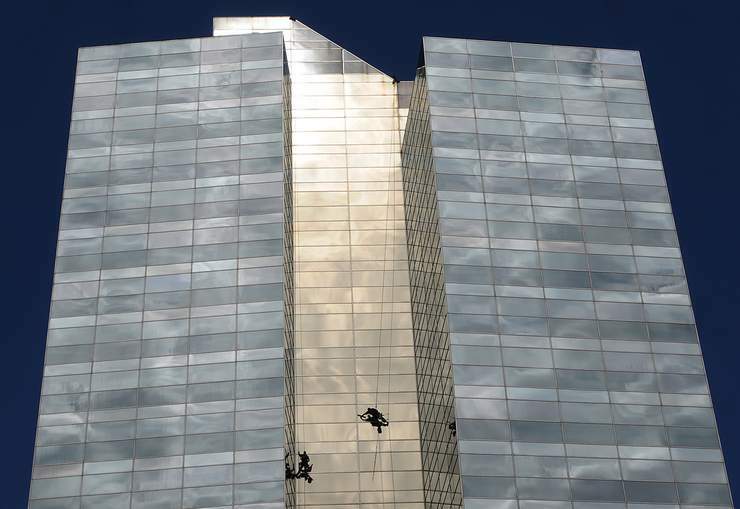 Whether you are looking to schedule regular glass cleaning for retail store-fronts, or to contract glass cleaning for your high rise building, LA Window Cleaning is the company you want to contact. LA Window Cleaning always keeps safety at the forefront. We are a fully insured company, with staff trained in how to create safe work spaces for themselves and your customers and employees. Depending on the design and height of your building one or more of the techniques below will be used to safely access your exterior windows. Refers to a technique where ropes and specialized hardware are used as the primary means of providing access and support to workers. A two-rope system is employed: the working rope supports the worker and the safety rope attached to the worker’s body harness provides back-up fall protection. 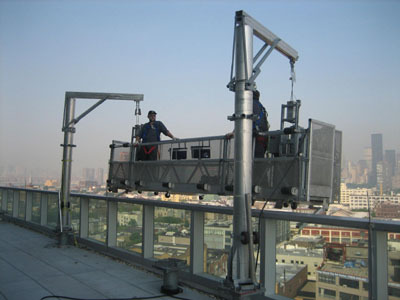 Bosun Chair is a safe, versatile, efficient, and economical method to wash windows on buildings up to 40 stories high. When a job is over 40 feet or requires screen removal, harsh chemicals or other non-standard applications, an aerial boom lift is often the safest choice to access and clean the glass. Other factors may also necessitate the use of an aerial lift, i.e. lack of proper roof anchors, excessive overhang, unstable or easily damaged parapet or building coping, etc. Safety lanyards and body harnesses are mandatory for workers using aerial lifts. For window cleaning suspended scaffolding is generally reserved for buildings above 40 stories or where the use of harsh chemicals are being applied. Most larger buildings have permanently installed staging to be used by qualified contractors. 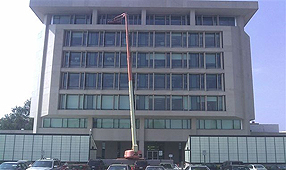 Non-permanent suspended staging can be set up on buildings lacking a permanent installation. Permanent or temporary suspended scaffolding use basically the same principle. Metal scaffold suspended on steel cables that are safely anchored at the roof. Ascent and descent is controlled by the steel cables running through specialized electric motors. Safety lines and body harnesses are mandatory for workers. The ubiquitous ladder. For jobs under 40 feet and not requiring special treatment there is no more efficient window cleaning method than to bust out the ladders. Because common sense is the only “fall protection” when using ladders, their proper use is strongly impressed upon and frequently reinforced to all LA Windows personnel. 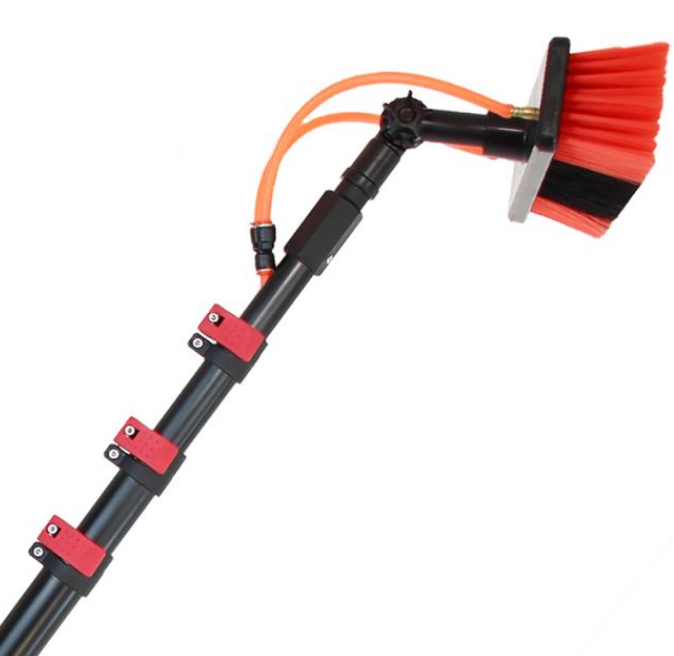 The water fed pole is a more recent window cleaning innovation and is utilized by LA Windows when other methods cannot be performed, due to landscape / building designs or for safety purposes. The Waterfed Pole uses de-ionized water to both scrub and rinse the glass for a spot free finish and often can clean frames & sills up to 60 feet high.We use the top of the line Unger Carbon Fiber pole systems with a 600′ hose which enables us to often only have to access a single water source onsite. We also employ industry leader Culligan DI tanks to ensure the cleanest water available that will filter out impurities such as iron,calcium,etc that leave blemishes and spotting on exterior glass.